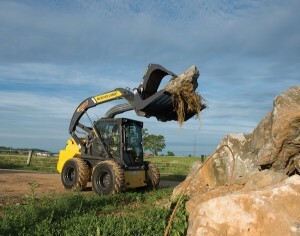 New Holland Construction unveiled its most powerful skid-steer loader to date, the L234, as well as updates to its 200 series compact-track loaders. Replacing the L230 skid-steer, the L234 has a tipping load of 6,800 pounds, bucket breakout force of 9,323 pounds and lift arm breakout force of 6,918 pounds. Powered by a 90-hp FPT F5B engine with Selective Catalytic Reduction, the L234 features O-Ring Face Sealed hydraulic ports and Super Boom technology. An available upgrade in the cab is New Holland’s demo door, a half-inch-thick “shatter proof” polycarbonate front door. A new safety lap bar is another factory-installed option on all models manufactured after October. Also unlike its predecessor, the L234 cab flips forward, which according to the manufacturer, allows easier access for cleaning and maintenance. As an added safety precaution, operators can lock out the booms before exiting the cab. A newly-designed heavy-duty, composite “hockey puck” boom stop prevents steel-on-steel contact and wear during digging, carrying and other operations. The boom stop can be changed for different carrying heights. When lowering the bucket and pushing into a pile, the boom will carry the load back into the boom stops, which allow the main frame to absorb the force. In addition to the L234, New Holland also debuted a new, low-profile undercarriage design for its 200 series compact-track loaders. This includes track frame upgrades to models C227, C232 and C238. An improved yoke-to-frame engagement produces less noise, according to New Holland, and a tightly fit-and-finished track frame minimizes exposure to material and moisture. Steel-embedded tracks rolling on rubber provide longer-lasting track life and a smoother ride, the manufacturer also noted, and an oversized bearing used in line with the drive sprocket and elevated drive assembly on the heavy-duty drive motor increases component life.